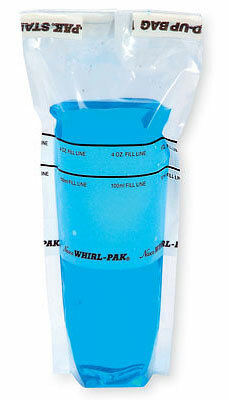 Whirl-Pak, Stand-Up Whirl-Pak sample bags make sample handling and testing much easier as they give users the ability to perform important laboratory functions with use of both hands -- this plastic sample bag will stand completely by itself, racks or holders are not needed to keep the sample bag upright. When a sample is placed inside, the special gusseted bottom flattens out, allowing the Whirl-Pak bag to stand up on its own. The white writing area makes sample identification easier and more convenient. The writing strip will accept ordinary ballpoint pen, pencil, or felt-tip marker. The paper-like finish virtually eliminates ink smearing, and provides a surface that will accept a variety of writing instruments. Stand-up sample bags stand on their own without racks or holders - when bags are filled, gusseted bottom flattens out, allowing the bag to stand up on its own. Smear-proof white writing area makes sample identification easier, will accept ballpoint pen, pencil, or felt-tip marker. For use with temperatures below 180°F (82°C). Capacity is measured in fluid ounces when the stand-up sample bag is closed and tab is folded over three times. 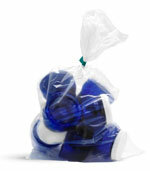 Volume and dimensions are approximate; sample bags should not be used at temperatures above 180°f (82°c). Bags can be frozen to any temperature, even liquid nitrogen - careful handling required after freezing. 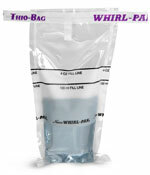 All stand-up Whirl-Pak sample bags are sterilized after manufacturing.